Originally posted: October 31, 2018 . Last modified: December 29, 2018 . 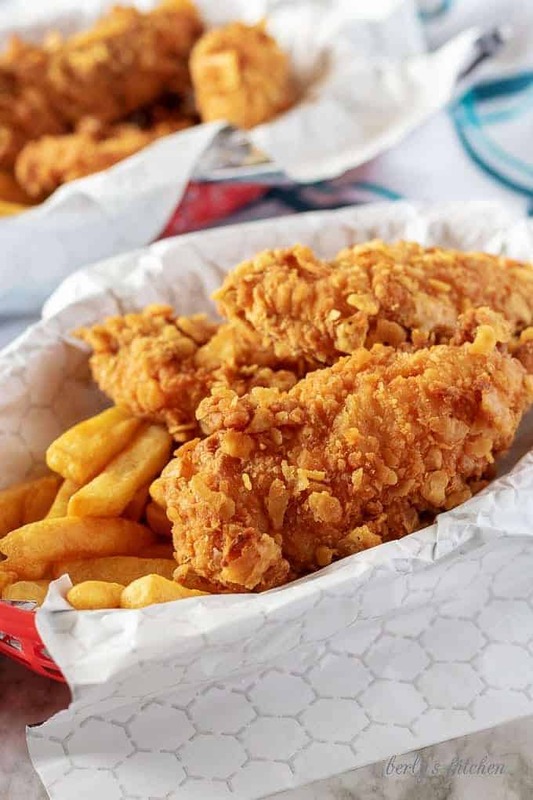 Homemade Chicken Tenders – Crispy on the outside and juicy on the inside, our homemade chicken tenders are full of flavor and texture. 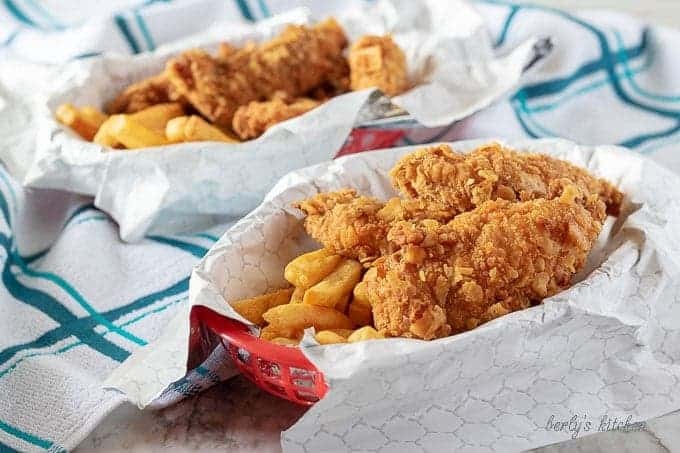 One bite of these and you’ll never want restaurant chicken strips again. 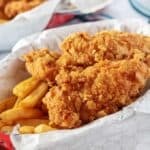 Who doesn’t love a great chicken tenders recipe? Well, except for Kim, I can’t think of anyone else that would pass up a great fried chicken recipe. That’s why Kim created this dish, I knew she had to share it. It’s a simple homemade chicken tenders recipe that’s sure to please the whole family. The breading is crispy, while the chicken is flavorful and moist. You’ve got to try this one out for yourself! Pair these crunchy chicken strips with some loaded mashed potatoes or jalapeno cheddar biscuits, and you’ve got a full meal! First, start by making the dry mixes. In one bowl combine flour and seasoned salt. Next, in another bowl, combine flour and one sleeve of saltine crackers that have been crushed into small pieces. Then, prepare the wet mix, which consists of eggs, hot sauce, and milk. Now, place this bowl on the counter between the first and third dry mixes. These will make up your “dry, wet, dry,” batter. First, generously season the raw chicken tenders with salt and pepper. Next, pour the vegetable or canola oil into your skillet until it is half-full and heat the oil over medium heat. Then, let the oil preheat for about four to five minutes or until the oil is hot. Now that the oil is hot and everything is prepped, start cooking the tenders. Gently, dip the tenders into the dry mix and shake off the excess flour. Then, fully submerge the chicken into the wet batter, again shake off the excess mix. Afterward, dip the wet chicken into the final dry mix, press it gently on both sides. Last, carefully, place the chicken tenders into the hot oil to cook for 5-6 minutes on each side. That’s it, remove the finished tenders and place them on a paper towel to drain off the grease and then serve. Use the “dry, wet, dry,” method when frying. It locks in the juices and keeps the meat moist. Out of saltines? Then try corn flakes or buttery, Ritz Crackers in your breading. Preheat the oil over medium heat and don’t overfill the pan with raw chicken. Only fry a few pieces at a time. Instead of using a deep fryer, try a cast iron skillet to make these chicken tenders. Cast iron works beautifully! Chicken recipes are some of the tastiest! If you want to see more, check these out: Slow Cooker Shredded Chicken Tacos, Slow Cooker Buffalo Chicken Meatballs, and Smoky Chipotle Chicken Pasta. If you make Homemade Chicken Tenders, I’d love to know how they turn out. Also, if you like this recipe, please leave us a comment and rate the recipe card. You can also find us on Facebook, Pinterest, Twitter and Instagram searching for Berly’s Kitchen! 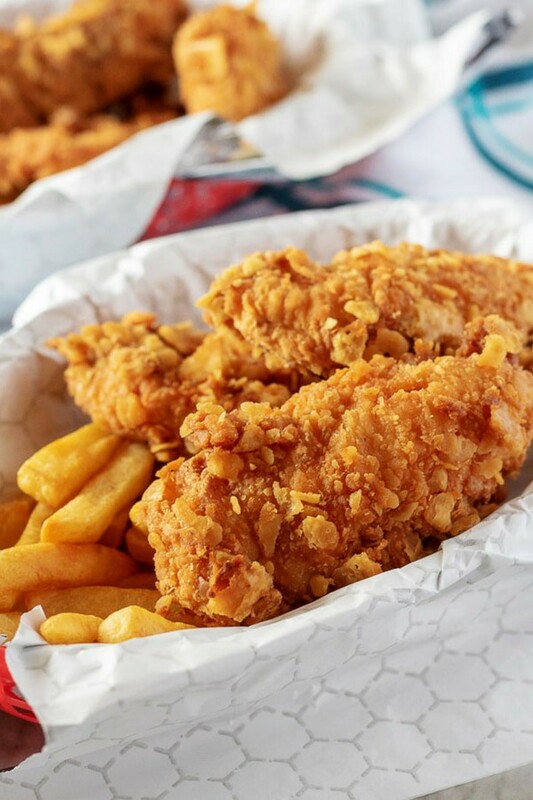 Crispy on the outside and juicy on the inside, our homemade chicken tenders are full of flavor and texture. One bite of these and you'll never want restaurant chicken nuggets again. Season chicken generously with salt and black pepper. Pour cooking oil into a deep skillet leaving about 2 inches from the top of the skillet for the oil to expand. Heat on medium-high heat. 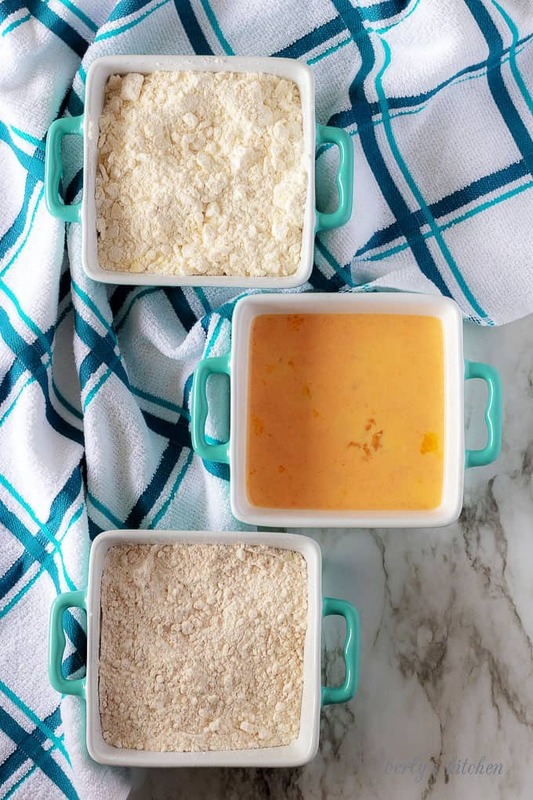 Combine flour and seasoned salt in a medium bowl. Beat eggs, hot sauce and milk in a medium bowl until combined. Combine crushed saltine crackers and flour in medium bowl. One at a time, place a piece of chicken in the first dry mix, making sure it is evenly coated. Shake off excess flour. Dip in wet mix and allow excess to drip off. Place in the second dry mix and thoroughly cover with cracker mixture. Press gently to ensure crackers stick. Carefully place chicken in hot oil. Cook for 5-6 minutes. Use tongs to turn chicken and cook the other side for an additional 4-5 minutes. 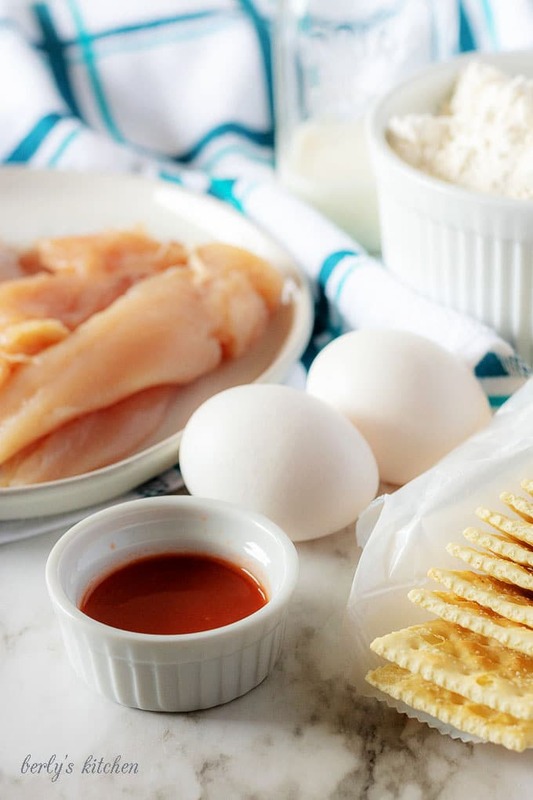 Place cooked chicken on paper towels to cool. The calories listed are an approximation based on the listed ingredients and a serving size of 2-3 homemade chicken tenders. Actual calories may vary. Thank you for commenting, Rachel! These chicken tenders usually don’t make it to the next day lol! In regards to baking them, I cannot remember a time when we tried baking them using this recipe. However, I make a different baked chicken tender recipe. Instead of using crackers for the last coating, I use Japanese panko bread crumbs and cook the tenders at 350 degrees. That gives me a crunchy crust, most of the time.